Salt & Pegram and IA worked with Bacardi on an Open Book, consultative basis. We worked together, hand in hand as a client, designer and furniture consultant team; meeting frequently and regularly to ensure delivery of a fast tracked, brand diverse project. Salt & Pegram were responsible for the full furniture package including loose furniture, systems, storage and accessories. 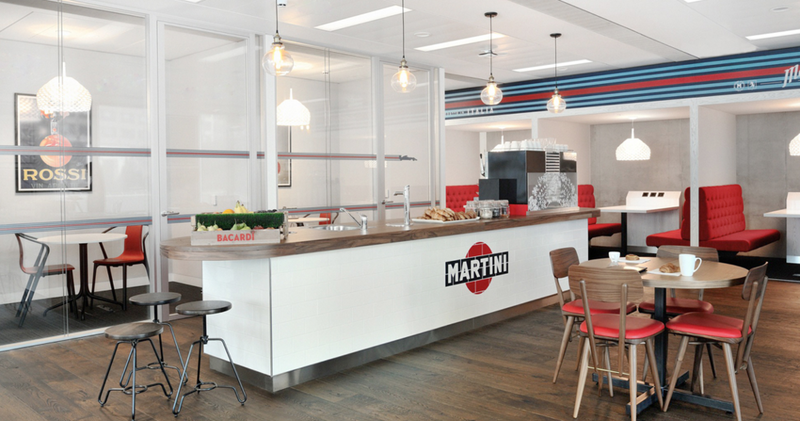 Bacardi wanted their communal spaces to reflect the organisation as a whole, with an empathy to the parent company Bacardi. However, the areas assigned to each individual brand needed to have a very obvious visual identity, clearly depicting the individuality and difference of each brand. The aim was to know exactly which branded company you were in, purely by looking at and experiencing the surroundings. We worked closely with the client lead who was based in New York, and liaised frequently with the marketing teams, ensuring each branded space was on point and true to its values. Bacardi really embraced the location of East London and wanted the furniture to reflect the ‘Shoreditch’ vibe. To enable this, we sourced an eclectic mix of ‘off the shelf’ and vintage pieces. Where the client believed nothing in the market place could meet the brand identity, we had bespoke product designed and manufactured specifically.